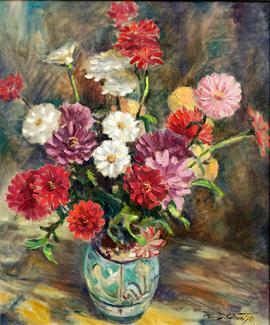 This image is from a painting known as Zinnias. The flower detail is set in resin and placed in an antique silver plated circle pendant. The resin-coated wire is hand-beaded with freshwater pearls, antique silver, garnet, rose quartz, Swarovski crystal, moonstone and clear glass seed beads. The necklace is finished with a lobster claw clasp. 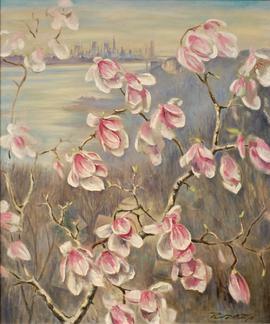 This image is from a painting called Magnolia and River Winds. The magnolia petal detail is set in resin and placed in an antique silver plated circle pendant. The beading for this necklace includes freshwater pearls, antique silver, garnet, rose quartz, moonstone and clear glass seed beads. This necklace is finished with a toggle clasp. 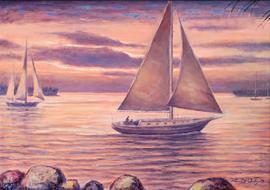 The pendant image here is from a painting called Sunset Sail. The dramatic sky and sailboat are coated in resin and set into the antique silver plated circle pendant. The strands are hand-beaded with freshwater pearls, antique silver, rose quartz, moonstone and clear glass seed beads. They are attached to saddle leather ties, and finished with a lobster claw clasp. As always, all the items are hand-made and contain minor variations, which makes each piece of jewelry unique. "Each of these necklaces were inspired by favorite images from my father's paintings. For me, each represents something very special, and they remind me of the great care and concentration which was an important part of my father's work. The colors he mixed on his palette helped to convey the emotions he engaged as he painted, and you could see the purposeful effort he put into every brush stroke."